When marketing a B2B inside sales or technology company, there are many platforms to take advantage of, and one of the most important is social media. Although there are multiple social media channels, LinkedIn is the best channel for good selling opportunities for B2B companies. 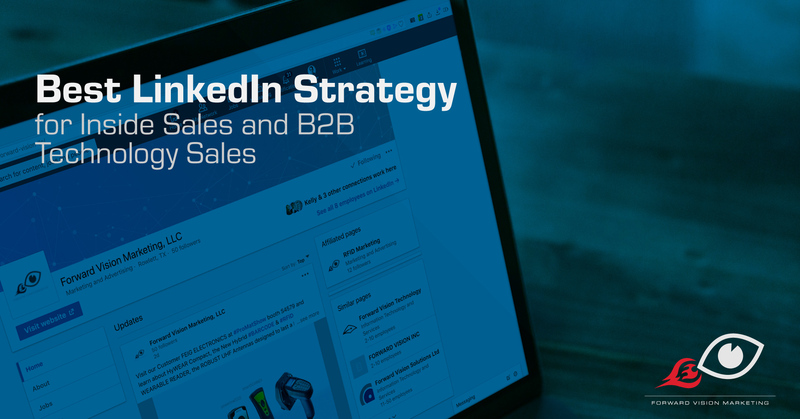 Read on to learn more about how you can best use LinkedIn strategically to market your inside sales or B2B tech sales company and how you can harness the expertise from the Forward Vision LinkedIn Social Selling workshop to make sure you’re getting the most from the platform. If you want to use social media to sell effectively, it’s key to rely on LinkedIn. LinkedIn is essential for social selling because business buyers rely on it to make purchasing decisions. In the 2018 LinkedIn State of Sales Report, 62% of business decision-makers said that they looked for an informative LinkedIn profile from sales reps they’re considering buying from. Additionally, research done by Dell showed that 75% of B2B purchasers were influenced by social information that they found on company’s social pages, like their LinkedIn. Thus, if you want to utilize a resource that people repeatedly turn to for buying information, you should not overlook LinkedIn. Share interesting posts from your connections that pertain to your industry, or that can help you show your loyalty or support for that connection. In addition to directly reaching out to past and potential customers, you can also use the social platform to expand your network of customers. Do this by targeting second connections, which are people and businesses who you are not directly connected to you but who are connected to the people you are connected to. Directly connecting to a second connection with a message about who you are and why you want to connect. Connecting with second connections helps you build a solid LinkedIn network and gives you more demographic information to create a realistic and helpful set of personas. If you are ready to use LinkedIn to make more sales, contact the experts at Forward Vision Marketing. You can schedule an Effective LinkedIn Social Selling Workshop, where we show you the basics of selling on the site, as well as tips and tricks you can use to make sure you’re reading as wide of an audience possible, and converting potential B2B leads into paying (and repeat) customers. Check Out the Latest Wireless Technology Trends at RFID Journal LIVE!